CAMBRIDGE, Ontario -- Just two months ago, efforts by the Canadian union Unifor to organize two Toyota Motor Corp. plants in Ontario had all but ground to a halt. But an April announcement that Toyota will move production of the Corolla from its 27-year-old plant here to a new factory to be built in Mexico ignited fears of job cuts among Toyota workers. And now the Unifor campaign is springing back to life. The shift likely signals the start of a drama that will play out over the rest of 2015 and will determine whether the plant here and another in nearby Woodstock will become the first unionized Toyota plants in North America. Union organizers said they hope to have a vote on representation by the end of the year. "This news with the Corolla has really served to ramp up things again," said Lee Sperduti, a team leader in the final assembly area of the Cambridge plant who is working to build support for Unifor. "Here they are, sending the bread and butter to Mexico. It was an eye-opener." In the past few weeks, Unifor members from other Canadian auto plants have come to Cambridge and Woodstock to join renewed campaigns to build support among the company's 7,500 Canadian hourly workers. Two informational phone conferences hosted by Unifor for Toyota employees this month drew about 600 callers, the union said. On Saturday, May 30, the union is planning a major rally starting at the factory gates here and ending at a nearby school, where organizers will hand out leaflets and offer both full-time and temporary Toyota workers opportunities to sign union cards. In a telephone interview, Brian Krinock, president of Toyota Motor Manufacturing Canada, said the decision whether to unionize lies with the plants' team members, as the company refers to its workers. But he added that the automaker "doesn't see the need for a third party." Krinock also said workers have little reason now to fear future job reductions when the Corolla moves to Mexico. The small car will be replaced by a midsize vehicle that, he said, could require the same number or even more people than now work at Cambridge's north wing, where Corollas are assembled. He acknowledged, however, that he "can't say what the future work force will be." That uncertainty about job security has changed how at least some workers view Unifor. Cindy Venier, a Toyota employee for the past 11 years, said she fears the company will retool the Cambridge plant after Corolla production ends and use the downtime to replace full-time workers, who make about $34 Canadian (about $28 U.S.) an hour, with contract workers earning just over $20 Canadian an hour. "Without a collective agreement, none of us are safe," Venier said. She has been helping to hand out information sheets at the Cambridge plant's gates. One day recently, 70 workers stopped before entering to hand over signed union cards, she recalled. "In the past, people thought joining the union would endanger jobs," said Jim Stanford, Unifor's chief economist. "Now they see that joining the union might help them save their jobs." Unifor -- the larger union that absorbed the Canadian Auto Workers in 2013 -- is fighting against a broader decline in its nation's auto sector, caused by high labor costs as well as unfavorable exchange rates, a lack of economic incentives from the government and other factors. A Unifor win at Toyota could give the union momentum to mount a campaign at the Honda plant in Alliston, Ontario, the only other foreign-owned and nonunion auto plant in the country. It could also give inspiration to the UAW, which is actively working to organize a Mercedes-Benz plant in Alabama and a Nissan plant in Mississippi in addition to VW Chattanooga. 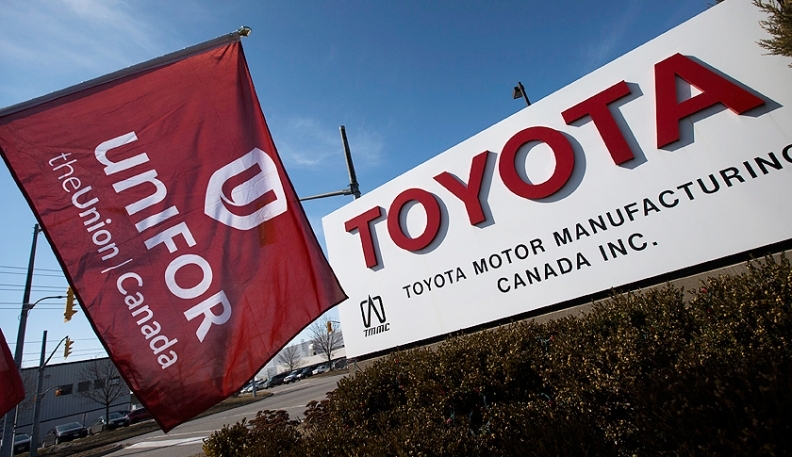 At Toyota, Unifor faces an uphill climb. The company pays its full-time workers about the same as veteran Unifor workers earn at Ford, GM and Fiat Chrysler plants, and previous organizing drives have failed. In April 2014, Toyota workers were poised to vote on Unifor representation, and the union was confident of winning a majority among a work force it believed numbered about 6,500 people. But just days before balloting was to begin, Toyota announced it actually has 7,500 on its payroll, raising the number of votes Unifor would need to win. Fearing it would fall short, Unifor called off that vote. Organizing efforts continued through 2014, but by the beginning of this year, further organizing seemed futile. Bob Van Cleef, Unifor's lead organizer of the Toyota campaign, had been getting organizing help from 14 Unifor members from other plants who traveled to Woodstock and Cambridge to reach out to Toyota employees; in February, he sent them home. Then Toyota announced its $1 billion investment in Mexico, where the Corolla will be built starting in 2019, and the mood in Cambridge and Woodstock changed. Van Cleef called his 14 organizers back into action. "We were getting calls. People started coming in, looking for information," Van Cleef said. A barometer of the union's prospects can be found in a small "war room" in Unifor's Kitchener, Ontario, office, where organizers are tracking their progress worker by worker. Plastered to the walls are dozens of letter-size sheets of paper listing the names of all the Toyota plant employees Unifor is aware of. Names highlighted in yellow indicate workers who have signed union cards recently. Red is for people who signed more than a year ago and must be contacted to re-up. Scattered among them are perhaps two dozen names in green, denoting employees who are actively campaigning for Unifor on their own time inside the plants. The majority are in gray. Those are workers who haven't been contacted or have expressed opposition to Unifor. But since the Corolla announcement, Van Cleef said, "there's a lot more yellow."